We have just launched a very popular feature that many of you have been asking for. Skip Logic gives you the ability to skip certain pages based on what participants have previously answered. Your survey should be as easy to complete as possible. Too many pages with questions that don’t relate to the participant can lead to more drop offs and incomplete results. With Skip Logic, if somebody already answers that they like cats, then you can skip the page asking them why they do not like cats and go directly to the next section. This feature is available starting from the Business Plan and opens up many new ways that you can structure your survey. We are really looking forward to seeing in what ways you use it. Today we are happy to announce that Survey Redirection is now available! 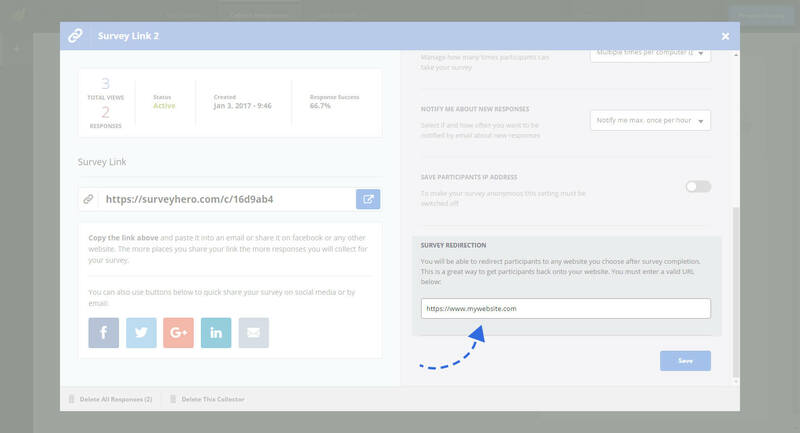 By default, your participants will land on a SurveyHero landing page after survey completion, however, now you can redirect your online survey participants to any website you choose after they complete the survey. This feature is available starting from the Business Plan and can be a very useful way to get your online survey participants back onto your website. If you want to allow your participants to enter a date in your online survey, then the new “Date” question type is going to make your life a lot easier! You could use a “Textfield” question to get dates, however, the problem here is that any value could be submitted and even if your participants entered a date, you would end up with many different formats in your survey results. The “Date” question allows users to select a date from an actual calendar, giving you a consistent format in your results!